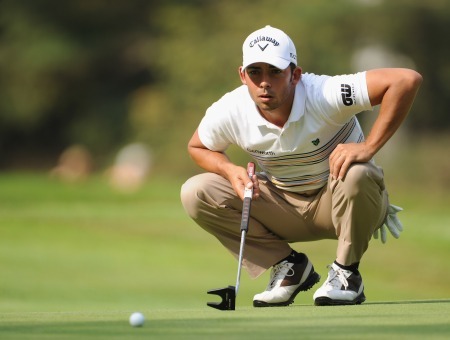 Barcelona native Pablo Larrazábal birdied five of the last six holes for a superb 64 to grab a share of the lead in the KLM Open. Photo © Getty ImagesSimon Thornton stormed home in 31 to keep his victory hopes alive in the KLM Open at Hilversumsche Golf Club. Needing a top finish to boost his chances of retaining his tour card, the Royal County Down man went to the turn in two over when he double bogeyed the ninth. But his putter warmed up on the back nine and birdies at the 11th, 14th, 17th and 18th gave him a two under 68 that left him just five shots behind a quartet of leaders in joint 10th on seven under par. Spain’s Gonzalo Fernandez-Castaño and Pablo Larrazábal and Scotland’s Scott Jamieson joined Graeme Storm in a share of the lead going into the final round. Englishman Storm had opened up a five shot lead midway through the second round but after going 48 holes without a bogey, he dropped back-to-back shots on the 13th and 14th holes before four straight pars coming home for a one under par 69. That left the door open for the other three to catch him on 12 under par, with Spaniard Larrazábal birdieing five of the last six holes for a superb 64. Fernandez-Castaño, who recovered from a double bogey on the ninth hole, and Jamieson also finished strongly with birdies on the 15th, 17th and 18th holes for matching rounds of 66. Storm, who is in 114th place in The Race to Dubai, remained upbeat despite losing the outright lead. “I had two bad swings on 13 and 14,” he explained. “I had the tournament in the palm of my hand before that, but it should be a good day tomorrow. I’ve only had two bogeys in 54 holes, which is quite impressive. Ryder Cup player Peter Hanson is one shot further back following a 67, which came despite concerns over the health of his baby son Tim who was taken into hospital on Friday night with a respiratory virus. “I tried to hang in there and focus on what I was doing at the time, but my mind was wandering on and off,” he said. Darren Clarke shot a three under 67 to move up to tied 31st on three under alongside Damien McGrane, who birdied the last two holes for a 70. Peter Lawrie slipped back to tied 48th on one under when he bogeyed three of his last four holes and signed for a one over 71. Gareth Maybin slipped back to four over after a 74. Ireland's quintet of survivors are all but making up the numbers in the KLM Open at Kennemer Golf and Country Club in The Netherlands. Five of the 10 Irish made the cut as Pablo Larrazábal fired a course record 62 to lead the KLM Open at Kennemer Golf & Country Club. Just three of the seven-strong Irish challenge are in postion to make the cut after the opening round of the KLM Open at Kennemer Golf and Country Club. Simon Thornton carded a second round 64 in the KLM OpenA happy reunion with an old putter helped Simon Thornton fire his lowest tour round for nearly a year and boost his chances of retaining his European Tour card. Peter Hanson with the KLM Open trophy. Picture © Getty ImagesSimon Thornton missed a golden opportunity to retain his card as Peter Hanson ended a difficult personal week on a dramatic high note after holing a 30-foot eagle putt on the last to win the KLM Open.